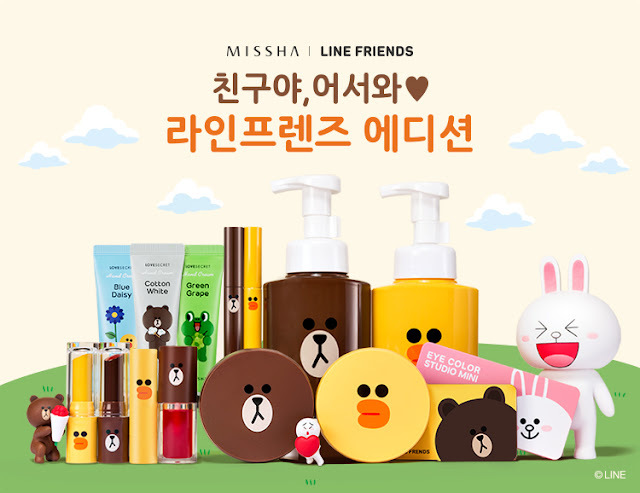 Missha came out with a special package collaboration with Line Friends. The packaging is adorable and this limited edition cushion has hydration properties, sun protection properties, micro pgment cover and it has a silica bead powder that helps to absorb sweat. I was not into Line that much, but the bear design compact are just to cute! It comes in this bear brown box and of course, it comes with a refill. Each cushion contains 15g worth or products and mine is in the shade No.21. Also it has a puff replacement in the box. Its like getting 2 products in one price. Of course I love the packaging. The cushion case it self is just like all standard cushion case, the only difference are just design and size. The sponge itself has a bear printed pattern on it. Super cute! The cushion itself has a soft touch to it and the shade on my 1st impression swacthing it on my hand is pretty fair. So below is what I think after trying it on my face itself. On the left side is my bare skin, just basic mosturizer that I have applied in the morning. My skin is pretty dry. After applying the cushion, I can see that it does covers up a few redness, but I find that the shade has a bit of a greyish understone which makes my skin looks a bit fairer that what I wanted. Also it looks a bit pathy on the side of my nose. As told before this has a matte effect and I think it is more suitable for oily skin. The Line Friends edition comes in two varieties which is this one which is the Bear (Matte finish/normal Missha compact cushion formulation) and the other one which is Sally the duck is the moist edition (for dry skin). Each compact retails for RM75.00.